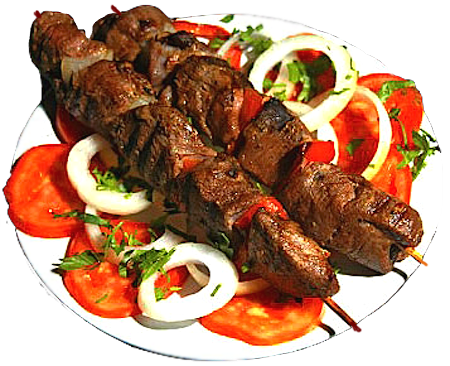 "Shish" meaning skewer and "Kebab" meaning chunks of lamb. throughout the Mediteranean, the Middle and Near East. Vegetables skewered between the chunks of meat, can be onions, cherry tomatoes, bell peppers and mushrooms. 1. Remove all the fat and tendonous gristle and silver skin** from the lamb and cut into 2 inch cubes. correctly,  this will be "melt in your mouth" tender. onion,  mushrooms or cherry tomatoes. cooked and used in a bulgour pilaf,  which makes an excellent side dish.